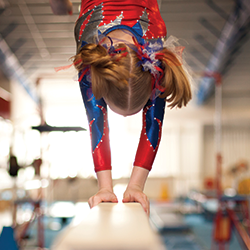 Some say the benefits of gymnastics are physical – increased strength, flexibility, agility, coordination, balance – while others praise the emotional benefits of concentration, goal setting, confidence, and self-esteem. At Salem, we know that, without a doubt, both are true. While we have gymnasts who have trained to National Titles & NCAA scholarships, we take great pride in those who have continued on to soccer, field hockey, diving and track scholarships, medical school graduates, and leaders in business and politics. Former Salem gymnasts have founded their own gymnastics schools and work as gymnastics judges at National Championships and here on our staff as well! However we take the most pride in seeing our former students walk back into our door, bringing their own children here for instruction. 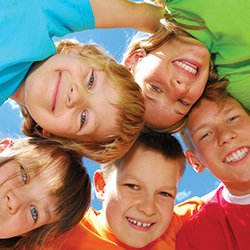 Discover for yourself why former students want their children to be part of the Salem family. Learn gymnastics skills on all Olympic apparatus plus Tumble-Trak, with a focus on advancing onto our recreational teams. Girls with no formal gymnastics training should enroll in this class or Tumbling. Tuition listed is per month for one class per week. Click through the tabs below to FIND A CLASS and REGISTER TODAY! Don’t be afraid of waiting lists – we make adjustments based on demand. Please review our Gymnastics Class Policies before starting class. Girls on the Red and Blue Teams have progressed beyond beginners and are ready to “Go for the Gold!” Red and Blue Team girls learn routines on all Olympic apparatus and perform in non-competitive demos where they earn ribbons based on their personal best. Red & Blue Team gymnasts have the option to compete in low key, in-house Fun Meets where they earn medals and a trophy. By invitation only. Classes are 55 or 85 minutes. Tuition listed is per month for one class per week. Blue Team girls are recommended to take two classes each week. Tumble with us! Offering co-ed tumbling classes, we have classes strictly for beginners as well as advanced tumblers. Basic tumbling is for beginners, up to a standing back handspring. Advanced tumbling is for those who can already do a round off back handspring or more. ATTIRE: All students must wear either a t-shirt and shorts or a leotard. NO BARE MIDRIFFS ALLOWED. Salem offers a variety of competitive experiences for girls who have advanced beyond the Blue team level. All are by invitation only. Visit our Competitive Gymnastics page for for information.